(Portland, Oregon) – It's the first few days of January, and the temperatures are below freezing in the Portland area. The night skies are especially clear throughout Oregon, with even those on the coast raving about the particularly glittery show the stars are putting on. And if you’re a camera – not a human – you might have noticed some strange colors in the stars (as seen in this detail of a larger photograph above). 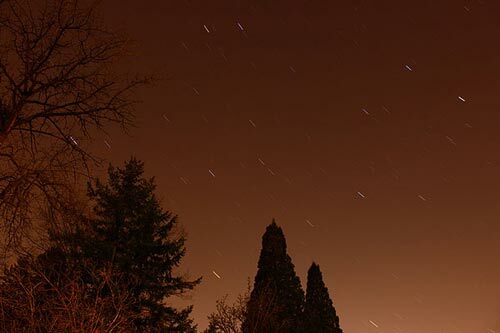 A meteor shower called the Quadrantids is apparently raging periodically above Oregon, but there’s no evidence of this as OregonTravelDaily.com cameras are out getting strange shots of star trails. These long, long exposure shots reveal some unusual things upon closer examination: the star trails contain different colors. Some are bluish, some on the red side, some whitish, and others simply blend in with the orange of the sky. 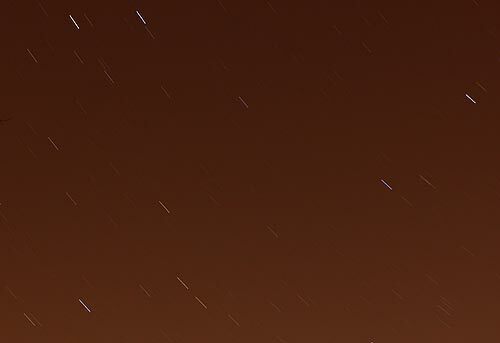 Someone suggests the star trails are the Quadrantids themselves. However, this is simply a result of taking three- or four-minute exposures in the middle of the night. But what of these odd colors in the trails? It appears this may be part of the Doppler effect, the color shift that stars go through while moving throughout the galaxies. They appear reddish or bluish, depending on if they’re coming towards us or heading away from Earth. Astronomers use this Doppler color shift to determine all sorts of things about a star. Are we mere mortals - meaning non-astronomers - able to see this effect from Earth without a massive telescope? Indeed, it turns out this is something else altogether, according to OMSI’s Jim Todd. The astronomy expert said it's an illusion created by gasses in the atmosphere and the fact a camera can see wavelengths of light a human cannot. "When seeing photos of stars, star trails, or other night images, people are often surprised by the unreal - or surreal – colors," Todd said. "They often think these photos are either fake or manipulated. While that could be the case, what most people don't understand about light is that the human eye doesn't discern between the chemical compounds that make up light. Humans view a very narrow spectrum. Cameras, on the other hand, can pick up light wavelengths that are composed of chemical compounds like helium, hydrogen, and so on. These chemicals change the 'color' of light that that we can't easily see, but cameras can." These photos taken from a frozen chunk of ground in Washington County, in the Beaverton/Portland area, also show an odd color to the sky - yet another atmospheric effect that cameras catch but you can't. There is no moon present, so things are orange. But if you're shooting night shots when the moon is around, you get more of a blue color to the sky that we're all familiar with. If you're trying to photograph stars in the night sky, you're going to need a tripod and a really long exposure. Depending on any number of other photographic technique factors, you’ll likely be dealing with exposures of longer than 20 or 30 seconds, often a few minutes. This will result in those star trails, Todd explains. 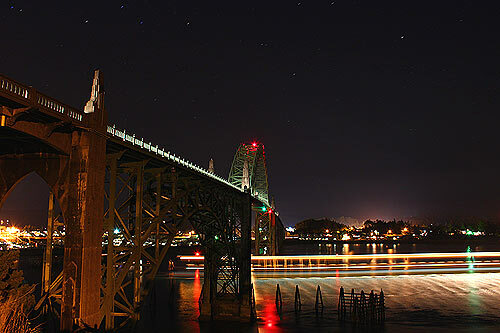 You can see this action in the shot of Newport, on the central Oregon coast.